After our detour inland we drove back to the coast, picking up on our original intended route. 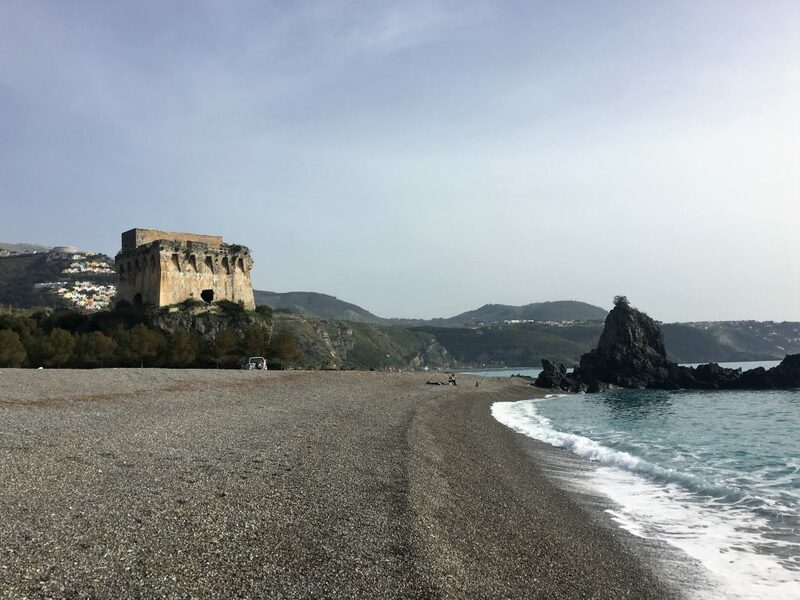 This time we were heading for a long stretch of sandy beach south of the splendid rockiness of Maratea and the blocked roads at Castrocucco. Praia a Mare is one of those bland Italian resort towns that you seem to find wherever there are long featureless sandy shores. We battled with the railway line, trying to find a route to the seafront that wasn’t height restricted. Eventually we turned off the sat nav and used google, backtracking to the SP1 which bridged the railway. The ‘lungomare’ (sea front promenade) was pretty uninspiring so we got onto our bikes and cycled around to see if we could find a better spot for parking up. We enjoyed a reasonably long but flat cycle along the length of the seafront and then inland through the town. Towards the south end of the beach an island sits off shore, barely separated from the land. A parking spot here would be more scenic, but needed another drive under the railway. We couldn’t see any indication of the height of the bridge, but it looked ok, and the parking spot was on one of the motorhome parking apps so hopefully we’d fit. There was the back-up of a nice big turning area in case we needed to back out. We drove Bertie down, held our breath (because that will make a difference) and managed to get underneath with ease. We didn’t do much that afternoon, just wandered about on the shore and clambered over the rocks that formed the broken isthmus to the island. The resort was in maintenance mode with many people cleaning, tidying and re-erecting their beachside cafes. The following morning we moved on to find somewhere with wifi so we could watch the last day of the six nations. On our way south tried to visit Arco Magno, this is a beach inside a collapsed cave which forms an almost fully enclosed circle of limestone cliffs. 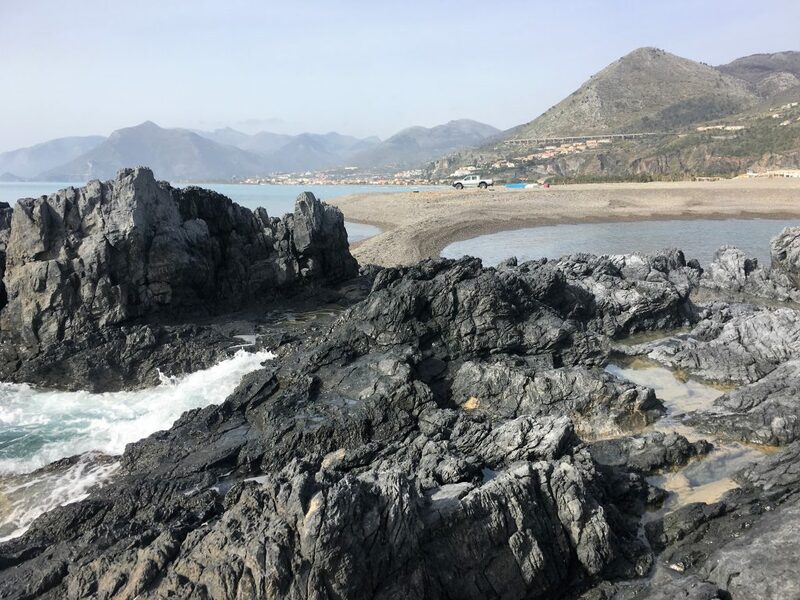 The only way to get there is to walk over the headland, either from Praia a Mare or from the resort just outside San Nicola Arcella. We chose to drive to the resort and intended to walk from there, but sadly the stairs over the headland were gated and padlocked. 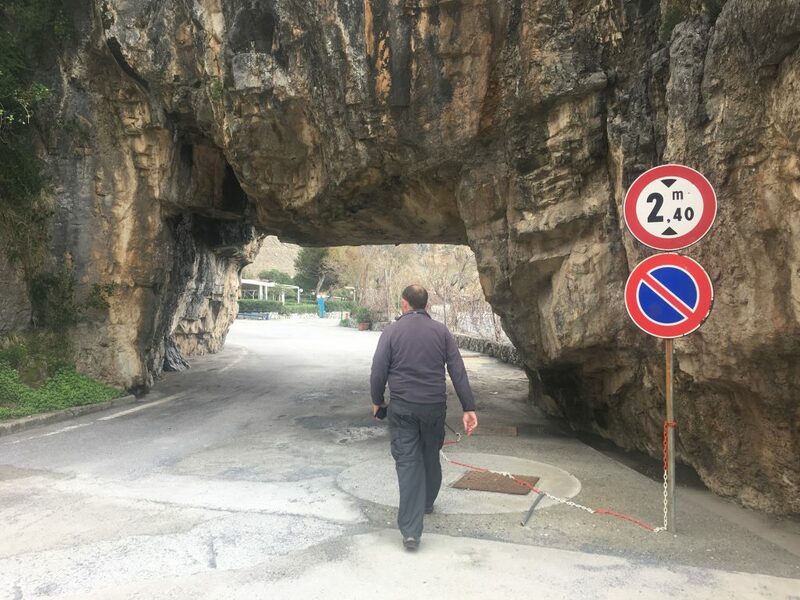 The rock arch to the resort south of Arco Magno. We definitely wouldn’t get under this one! We didn’t go much further south, stopping at a private sosta – Zio Tom – at €10 it was perfectly adequate for our needs, nice and quiet with good wifi. We hunkered down and watched a very disappointing final day of the six nations (unless you’re Irish of course, in which case well done). Two Churches but no Ice Cream!